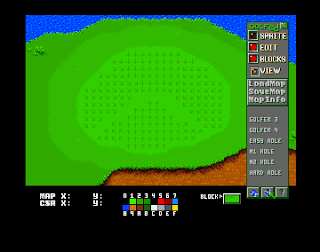 Hang about, go back to the start, what am I talking about ‘again’ I’ve not done any for a while, damn I must be getting on a bit as I’m time warping back to 1995 and the many hours, days, months spent designing and editing golf courses for Sensible Golf. Strange. Anyway as I was saying it took a bit longer than I thought but after several failed attempts to get me USB joystick working,(subject of a later post) I managed to sort out the shots as promised and just as I was about to close down the emulator I saw a disk image of the Sensible Golf map editor. Hmmm.. I wonder if it works? And if it does work will I be able to actually use it again? (cue tick tock music) It loads! Cool I thought… then.. well.. that’s about as far as I got. The memory banks that stored the ‘how to use it guide’ have become somewhat corrupted so I’m relying on that old favourite , trial and error. Unlike Cannon Fodder these tiles are 16×8! A brief break for some food followed by much clicking and pointing with more clicking and pointing thereafter revealed what can only be described as a light from the heavens. Well actually it was a loaded golf course map but you get the idea. So I’m now seeing a loaded map and those corrupted memory banks have began to self defrag. Result! Joyous triumphant cheering would be heard if I could be bothered. Strange thing memory, if you had asked me this morning how to use the Sensible Golf editor I would have look bewildered and puzzled, more than I would on a normal day. So what’s the point of this somewhat pointless exercise? Well I was kind of thinking how cool it would be to hack the original game graphics and levels I did back in the day with a newly created one off map and graphics, as you do. It was at this point a thought occured to me… Apart from me I doubt anyone would really be that bothered by it? As my to do list is quite big and *if* I was going to do something along the hack route with any old projects I would suspect Cannon Fodder is a clear winner for this kind of retro tomfoolery. Ah well the idea was good for all of about 5 mins including the ad break. 😉 That Cannon Fodder idea is starting to linger…hmmm… A new Cannon Fodder inspired game would be fund too!? 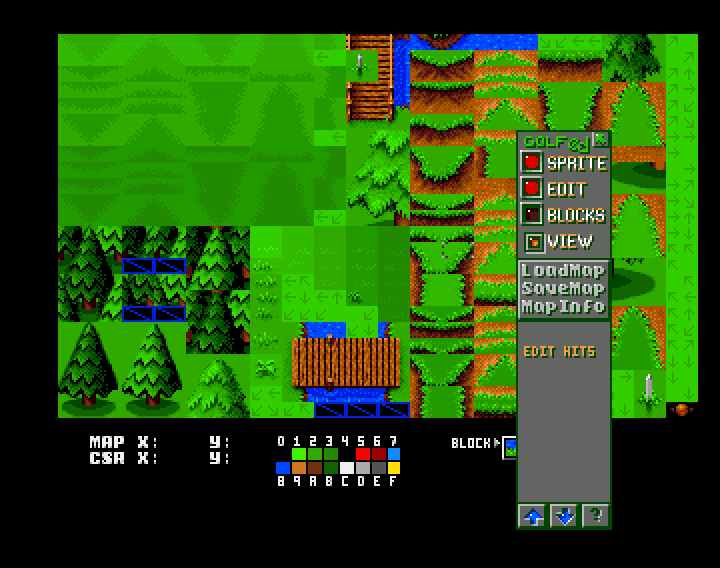 Note worthy addition, I created a map using Tiled instead.